I can't wait any longer. Mainly because I've got nothing else to write about. (More on that later.) Also note that much of what follows has zero salt if you believe deep down like me: to each his/her own. But that means I get mine too. You never know how long people have been trying to have a kid, so if it took you a month, shut it. Other medical things to keep to yourself unless asked specifically by a genuine, inquiring mind: whether you had an epidural, a C-section, breastfed or didn't, tore (you know what I mean) and just basically any kind of delivery (or pregnancy for that matter) horror. I got pregnant thinking everything bad told to me could very well happen to me. This is obviously not true. Only some of it will. And in varying degrees, from the chillax to the magical pregnancy unicorns to the drama queens. You cannot plan everything. From your baby's conception to its gender to its birthday to its birth. Old wives' tales are FAKE. You can't guess the gender people are having regardless of how they're carrying, what they're craving, what a ring on a string does or what direction the parakeets are facing. You don't own baby names. If you don't like people touching your belly, don't have the miracle of a tiny human life inside you. Girls are just as good as boys. Guys, if you think you have some sort of legacy to pass down, think again. And the carrying on the name thing? Ever think a family all has one name for the sake of simplicity? So relax and get over yourself. Your kid and any grandkids are your blood (and sometimes not if you're one of those angels who adopt) and will carry on exactly how much you loved them. Boys don't drool any more than girls do but this does make them look, well, you decide. Why do we memorize all the numbers of our delivery day for regurgitation at people who don't really care... At 6:42 a.m. I started feeling this thing I thought was pee, got in the car at 7:14, arrived at the hospital a half hour later, walked around for this many minutes ... And this all resulted in a X-pound X-ounce, X-inches long baby. Nobody cares except your mother. Pregnant women aren't always having a craving; we just finally feel it's okay to say we're hungry and want a burger and doughnut. Things to consider when considering maternity photos: What are you going to do with them? Facebook doesn't really need any more along with foot announcements, months old T-shirts and gender cake Instagrams. How much will it cost? Have you started that education fund yet? Will your husband look awkward? The answer is most likely yes. If you can avoid having a baby shower, you'll be guaranteed guilt-free 'no' RSVPs to everyone else's for the rest of your life. Nurseries are rarely used for nursing so ixnay the nursery label for femme-cave and equip it with whatever you want like Netflix and your sewing machine or a comfy reading chair by the window and room for your yoga mat. Rock a wine rack. The kiddo's book and movie shelf can easily be yours too. Don't act like the first birthday, first Christmas, first Easter, first trip to Disney is for them. It's for you. Be honest about it. It's okay. Keep something, anything, for yourself. I knew it would be hard to write about something other than parenthood for a while... It's like writing poetry about coming of age when you're 13 and a short love story when you meet the one. Or tragedy when it strikes. My head is a jumble of how I'll ever be sane again. How I read The Fault in Our Stars and cried more for the mom than the girl. I feel like when I'm alone, I'm spending quality time with my belly. I think of all the cool things I'm going to say to her (at which she won't be that impressed I know). 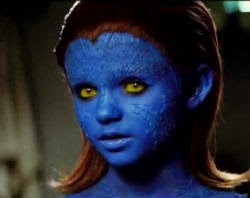 How I secretly hope she's born a little Raven from X-Men (pictured above). I'm officially crossing over to the light side (albeit somewhat in the shade). So if you feel you're any different than you thought you'd be at parenting or life, know you're not alone. In conclusion, babies will never be cool but they sure do make life interesting.